Please Full View and read before commenting. Happy Birthday to Eevaleena ( Sorry, it's so late! ) and also advance Happy Birthday to Fiifo. I recently got this Fruits Basket craze when I just finished reading the manga a few weeks ago and so I decided to make a Fruits Basket wallpaper. I really hope people haven't forgotten about Fruits Basket because the last submission I saw in the gallery was 8 months ago! [small]so I dont know if you'll still appreciate this wallpaper[/small]. I browsed through my scans of Fruits Basket and found that most of them were already walled and I finally found this scan and started my work. I reconstructed the some parts because The scan was cut in the middle... the hard part was the basket! You might be wondering about the eyes, but the original scan or Fruit's Basket art was already like that--> check the original scan. At first I wanted to retain the BG and color of the original scan, but I find it unattractive and dull and so I changed the color and door. When I finished the wallpaper, I saw that there is still something lacking and so I drew the interior of the house vectored the frame and it's angle then place a painting in it which is from here. Perspective really choked me to death..Then I also thought of adding flower petals. I made them blurry because they are near us the the focus is on the characters so is the painting behind them. I wanted to say a big thanks to our gradient abuser, Tens for the super big help! Also thanks to the sweetest Kitten, my KHR & VK -mate Trofi and also to my cute friend Yamionpu for all the help! This is sweet, I like it. Kyaaa such a lovely Fruba wall, one of my fav mangas! You did a really nice job on reworking both of the scans and putting them together with a fitting background. On the colours and detailing you did well to capture the soft pastel colours you usually see related to Fruba as well. OMG! 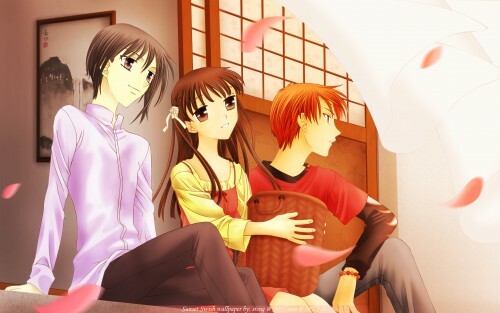 I LOVE Furuba! And seeing this (and for me too!) makes me wanna read the manga all over again! Bawww... it's one of the best manga I've read! Beautiful job on their hair, especially. I love the colors and how you did the scenery is amazing. all your work transforming tha original scan into a wall is marvelous!congratulations! kyo looks soo cool here! btw.. i love the colors.. so warm.. This wallpaper is beautiful! I love the new colors. this is beautiful! :) i love Fruba!